[dev] [dwm] Why am I having a gap between the master window and the others? I am using dwm 6.0.
appears between the master window and the others. Until now I have used dwm 4.5 and I never had this problem. Next message: Manolo Martínez: "Re: [dev] [dwm] Why am I having a gap between the master window and the others?" Previous message: ilf: "Re: [dev] Re: [st] 0.2.1 is out"
Next in thread: Manolo Martínez: "Re: [dev] [dwm] Why am I having a gap between the master window and the others?" Reply: Manolo Martínez: "Re: [dev] [dwm] Why am I having a gap between the master window and the others?" 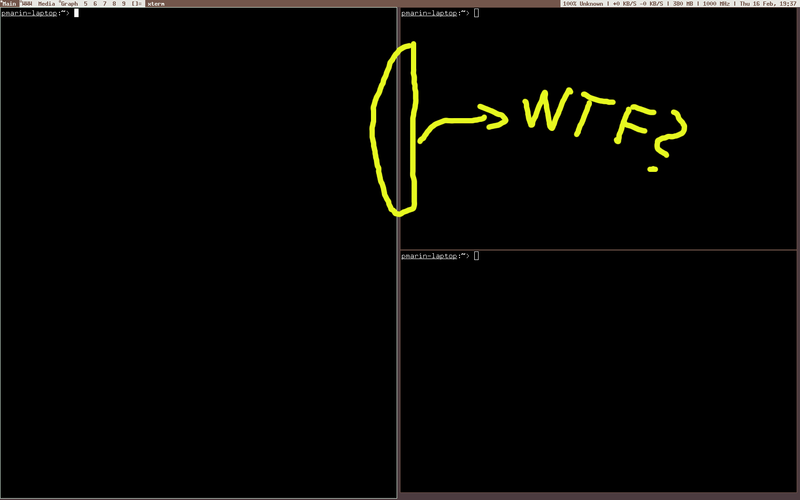 Reply: Hannes Blut: "Re: [dev] [dwm] Why am I having a gap between the master window and the others?"